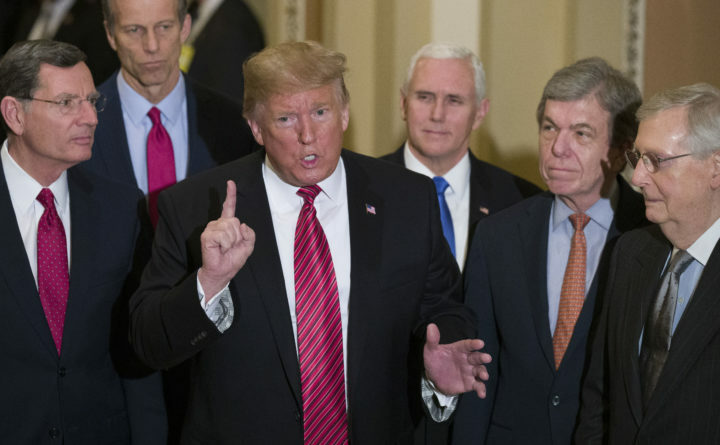 Sen. John Barrasso, R-Wyoming, left, and Sen. John Thune, R-South Dakota, stand with President Donald Trump, Vice President Mike Pence, Sen. Roy Blunt, R-Missouri, and Senate Majority Leader Mitch McConnell of Kentucky, as Trump speaks while departing after a Senate Republican Policy luncheon, on Capitol Hill in Washington, Wednesday, Jan. 9, 2019. He shuts down the government, maybe for “years.” He wants a wall that is “transparent,” then concrete, then slatted, then steel. One moment he’s leaving Syria, the next he isn’t. He’s watching too much TV and yelling at everyone. This is all to be expected. President Donald Trump is entering his terrible twos. The Trump presidency turns two this month, and though we often hear the mantra “this is not normal,” what the president is doing actually is normal. For a 2-year-old. And the terrible twos are defined by tantrums, which, Dr. Spock wrote, “usually start around age one” — Trump was precocious — “peak around age two to three” and are worse for “children who are less flexible.” So buckle up. In this case, we are Trump’s parents — the electorate, members of Congress, the media, all of us. (I challenge him to produce a birth certificate showing otherwise.) And, according to Dr. Spock, we’re doing it all wrong. Dr. Spock also explained Trump’s petulance during his televised meeting with Democratic leaders Nancy Pelosi and Chuck Schumer: “A child might just feel outnumbered when she has to take on two important people at once.” And Trump’s subsequent attacks on Schumer while ignoring Pelosi? “It’s more often the father who is particularly unpopular at this period,” Dr. Spock wrote. Clearly, White House aides are giving him too much “executive time.” Dr. Spock strongly opposed TV for 2-year-olds, “because it does all the work” for them. This is how Fox News ordered the shutdown. Nice job pulling yourself together after announcing the Syria pullout, Mr. President. Dana Milbank is a columnist for The Washington Post. Follow him on Twitter, @Milbank. Ukrainians have nothing left to lose. So they elected a comedian president.